Hello everyone, so I'll get straight to the point. 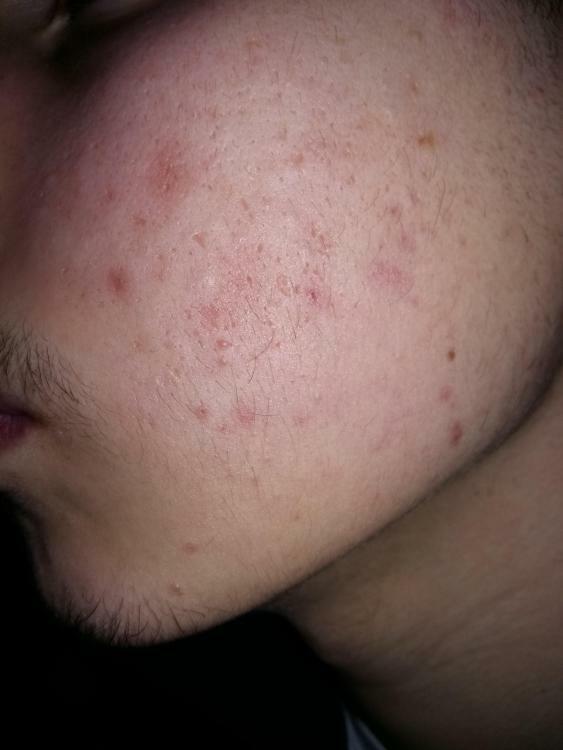 For about 2-3 years ago my skin started to show up acne behavior although i never had pimples or blackheads or stuff like that in my face. Just to point that I'm 21 years old and this started to happen after i got 17-18..At 18 i had an accident with my bicycle (I crashed and got a bit skinned on the right cheek and got some scars as you can see on picture 1). Anyways i got healed up upon time but now I'm facing this problem..I want some advises on what product(s) should i buy in order to make these go away..Also if someone can explain to me why these appear on my face (e.g What kind of acne i have). I will provide any information needed, and i am also a smoker a few years and i smoke sometimes cannabis. Bump..Anyone able to provide a solution to my problem ? Cheers! Hey this is what you do. Buy Cetaphil Gentle Cleanser and use it without water. The back of the bottle says no water. This Cleanser is a moisturizer and cleaner in one and it gets rid of scars slowly but surely. Do not use water with it though. Trust me this works. When you shower avoid water on your face. This Cleanser already has purified water so no need to use water and plus water is actually shown to dry out skin. Our skin is made of water however we need oil and emollients to lock in our natural protective barrier filled with water and fats. For two weeks, use that Cleanser. btw he back of the bottle even says don't use water so I'm not making this up. It's there for a reason. Water is bad for your skin!!!!! This Cleanser already has it in there and it's better than tap water which has minerals that dry skin out. You need those acne scars and acne to be protected with moisture. This Cleanser is also ph balanced. 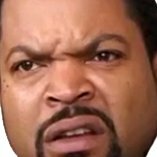 If you add water you throw off the ph. Our skin needs a certain ph to function properly. A lot of people ignore that. We need an acidic ph to be clear of acne. This Cleanser will maintain that and rid your acne. Also don't use moisturizer for two weeks or so. Just this. Trust me you will never have to worry about acne again. You may break out the first few days but this right here is the deallllllllllll. whats you do is rub a medium amount on one cheek in up and down motions for about 30 seconds or less than a minute. Then use your other hand to wipe it off. Do nottttttt use a wash cloth bc that's abrasive and harsh. Also it strips your natural protective barrier. Do the same thing for forehead and other cheek. Same process. I have a lot of knowledge on skin care and trust me when I tell you this will get rid of your acne. If you have questions I'll def help you!!! I had basically the same problem as you for about 3 months. 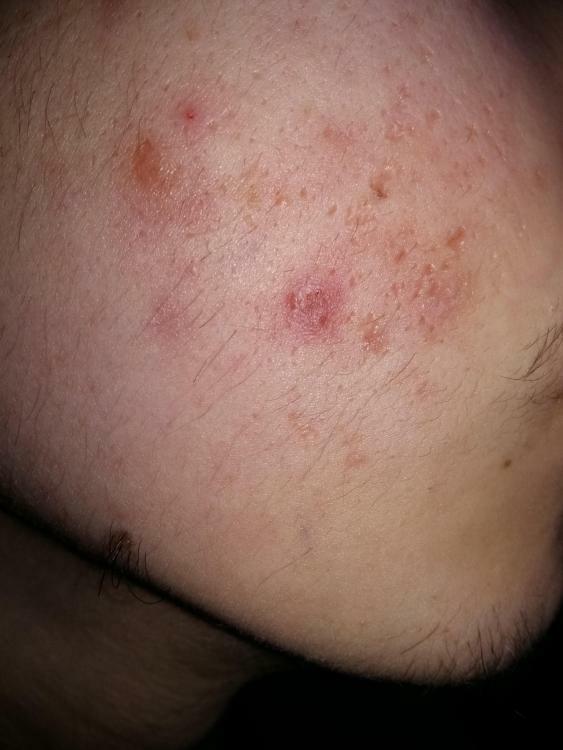 Flat, red marks and little inflamed areas. I tried absolutely everything from over the counter creams and serums to natural remedies... These are the things that helped me. A) I stopped smoking. I went from smoking about 3 times a week to 0. There are a lot of posts on the internet claiming it is very inflammatory and not good for the skin. Once I quit, I noticed the redness go down. B ) I changed my diet and incorporated a lot more vitamin C, E, A and D. All these vitamins are great for the skin and many studies suggest they help to reduce and manage acne / redness / acne marks. They reduced redness and helped in preventing breakouts. C) I stopped washing my face as often. For me personally, my face was too dry and a lot of my redness had to do with irritation, but this one is more so something that worked for me but could, or could not work for someone else, depending on their unique situation. Hope some of this information helps... my biggest advice is don't freak out becasue thats what I did and I ended up using the wrong products and making it worse. I would start with a cleanser and then add in an over the counter acne treatment like salicylic acid or benzoyl peroxide if you need something more. There are plenty of further options after that. Quitting smoking is definitely a good idea. Let us know how you're getting on in a few months. Alright thank you all for your interest, i will let you guys know about my progress! I have been told to try the cetaphil without water but I just don't get how it works. My face feels greasy afterward and I feel like its bad to not have it completely washed off. Water isn't bad for you skin. It's bad when it remains in contact with water for too long. Skin dries up. Ever go swimming and get prune like skin??? Not good. Dry and tight skin will produce more sebum which causes acne. Water has a ph of 7 which is neutral while your acid mantle is acidic and under 7. When water comes in contact with your skin, the ph of your skin changes which isn't good. That can cause TEWL (water loss within your skin) and dryness, which activates extra sebum production. Your skin responds to dryness by producting more oils aka sebum...and we know that too much sebum contributes to acne. Sebum or (OIL) is great don't get me wrong, it prevents acne since the environment is acidic however TOOOOO much sebum causes clogged pores!!!! This is what people miss!!!!! This is why we need a healthy balance and with that being said...a ph between 4.5 to 6.5 Needed. Cetaphil Cleanser falls within that range. Using it without water will prevent dryness and in turn prevent extra sebum or clogged pores. Basically acne skin isn't dry it's dehydrated...it's oily and dry. Dry skin is just dry without oil. Dehydrated skin is the perfect zone for acne. Your face feels greasy after the Cetaphil because of a few reasons. Either your overdoing it or (too much scrubbing causes dryness and then again more sebum). Be gentle. or your leaving a layer of it on. NO NO NO. You need to wipe it off with your other hand and finger tips. Why don't u try Wiping it off with a wash cloth veryyyyy gently. I did that in the beginning... it's faster results. The reason why I encouraged hands only is just to ensure no scrubbing was going on, but if you think you can be gentle with a clean wash cloth go for it. Try it once a night. Unless you sweat...then twice. Just make sure to avoid scrubbing hard bc that encourages dryness and dry skin is not good for acne. skin needs to have moisture and the right amount of water to function properly...you need water within your skin and a balance of sebum. And no..applying water on your skin doesn't give your skin water!!!! That's drying. Your skin is naturally made of water and it needs sebum and fats to hold that water in. That's what moisturizers are for. That's what Cetaphil Gentle Cleanser does. Use the cleanser without water it's not dirty. The Cleanser has purified water in it already, way better than tap. I'm telling you this works but you need to keep with it for at least 3 weeks or 4. You may get worst before better because the rubbing action wil spread acne bacteria in other locations but don't worry, keep doing it. Eventually you'll get better. This Cleanser recommended by dermatologists for a reason. Sorry about my typing errors...I'm on my iPhone lol.